November 1, 2016, 5:02 PM · Forget Carnegie Hall or Lincoln Center -- how about performing at the White House? 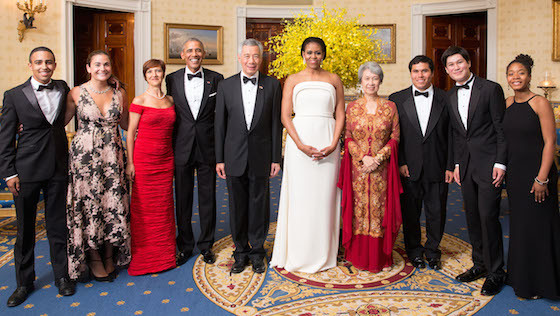 Here is a group of young musicians who did it: violinists Tristan Flores, 18, and Njioma Grevious, 17, cellist Lev Mamuya 20, and bassist Jordan Calixto, 22, who recently performed at a White House State Dinner with President Barack Obama and First Lady Michelle Obama, Vice President Joe Biden, Singapore’s Prime Minister Lee Hsien Loong, his wife Ho Ching, and 200 guests. All four are graduates of a Boston program called Project STEP, founded in 1982 to address the historic underrepresentation of minority classical musicians by identifying talented, motivated young minority students and providing them with access to high-quality string music training. "Playing for President and Mrs. Obama was a surreal, once-in-a-lifetime experience," said Grevious, a senior at Newton North High School near Boston. She started playing the violin with the program when she was five, after being intrigued by The Art of Violin. "I was enthralled by the beautiful music of Oistrakh, Heifetz, Perlman and others," she said via e-mail. "Watching clips of those great violinists truly inspired me." Her sister had been in the STEP program already for several years. "I definitely looked up to her, but I was also pretty jealous! So I asked my mom if I could play violin, too. This started the journey for me, and I am so grateful for Project STEP and the opportunities I’ve had along the way." One of those opportunities was the chance to be surrounded by diligent young musicians of color and to be introduced to successful professional musicians of color. "Spending time learning and rehearsing with other kids of color has been very encouraging and inspiring," Grevious said. "Through Project STEP I’ve also had the unique experience of attending several master classes with artists of color like Boston Symphony Orchestra cellist Owen Young, violinist Tai Murray and the amazing Harlem String Quartet." Violinist Flores, now a college student at Bard College, said that his eight years in Project STEP gave him a sense of community, being among other students with the same drive for musical achievement. "I was homeschooled for the majority of my life, and being with my fellow Project STEP students enabled me to connect with like-minded musicians," he said. Originally, he started with both piano and violin, but after a year he decided he liked the violin better. "It had this special sound that was closer to the human voice compared with the piano," he said, "so I dumped the keyboard and chose the violin." 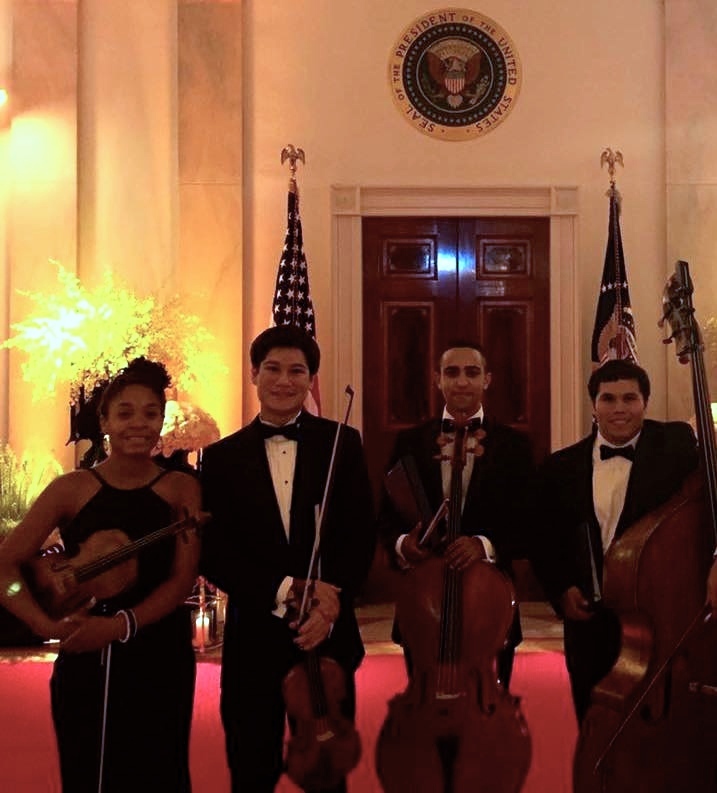 At the White House, students performed works of Bach, Mozart, and Handel as a quartet, then they joined in performance with the President’s Own Marine Chamber Orchestra. "The Marine Orchestra members are extremely talented and friendly, and the repertoire was a joy to play," Grevious said. "I will remember for the rest of my life how fortunate I was to meet the Obamas, how kindly they greeted me and held my hands, and how I was even more struck by their elegance and warmth in person." L-R: Njioma Grevious, Tristan Flores, Lev Mamuya and Jordan Calixto at the White House. Those of us familiar with the wonders of music education know that it tends to increases overall academic achievement, language ability, communication, graduation rates, and college enrollment, cultural awareness and more. Project STEP says that all of their students have gone on to college or conservatory, and 60 percent of its graduates are professionally involved in music. Flores is inspired to keep the music going. "In the future, I’d like to broaden the audiences for classical music," Flores said. "One of my conductors, Benjamin Zander, used to say, 'Everyone loves classical music, they just don’t know it yet!' My goal is to embody this philosophy." November 2, 2016 at 03:01 AM · That is awesome! Congratulations to those young people for their accomplishment! "One of my conductors, Benjamin Zander, used to say, 'Everyone loves classical music, they just don’t know it yet!' My goal is to embody this philosophy." Even if not everyone, I'm sure more people like it than we suspect, but might not let their friends know -- yet -- because of peer pressure. I saw hints of this among my classmates in high school. Now, with school behind me, I still see evidence of it. November 3, 2016 at 02:45 PM · Bravo! Thanks for this good news.